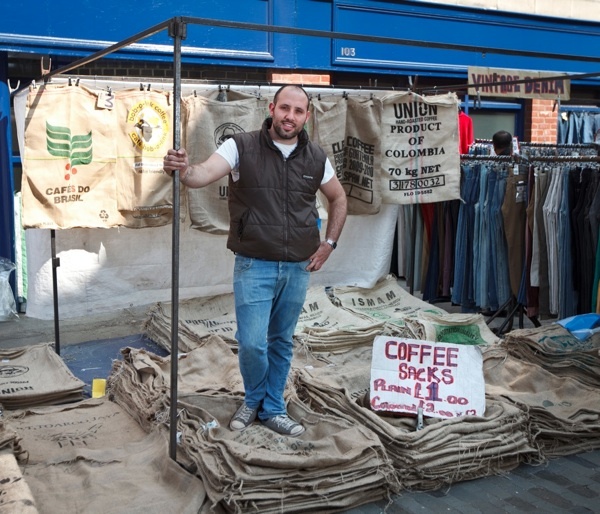 This is Paul Macatoni, the sack seller, with his fine display of printed hessian coffee bags from Africa, Asia and South America, that he has been selling on Sclater St for the past six months. “They’re popular, I’m in a niche market,” he admitted with glee, “People use them as decoration, storage, or to re-upholster furniture, to make cushions, beanbags and one lady even made a handbag out of one.” The amassing of so many sacks draws attention to their aesthetic qualities, attracting curious crowds to admire their typographic decoration and exotic trade marks, ensuring a brisk trade for Paul. The rest of the week he runs a call centre in Chigwell, but on Sundays Paul is big in sacks. 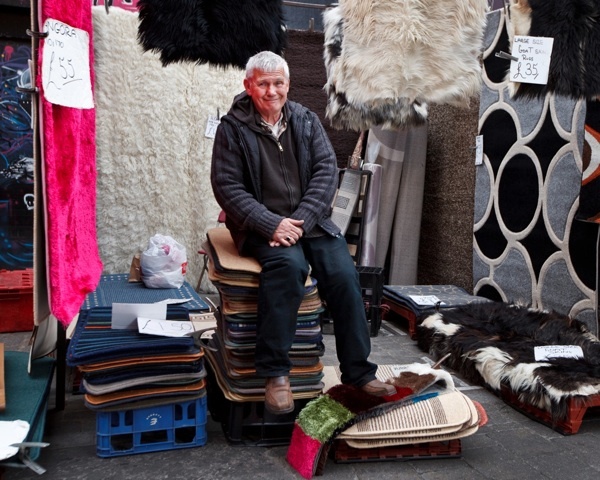 This is John Calcutt who has been trading on Brick Lane each Sunday since 1974. “I’m from Hoxton and I used to come down here when I was a little boy, and the stall next to me sold performing fleas.” he recalled affectionately, casting his eyes up and down the market, “It was absolutely packed by eight in the morning, they used to ring a bell at one o’clock then and you had to stop.” Now semi-retired, yet still energetic and limber, John comes from Dagenham to sell rugs here and in Deptford, three days a week.“I don’t like getting up early in the morning but I still come because I’ve got a mortgage to pay,” he confided as he began to fold up his wares, turning morose in his weariness. 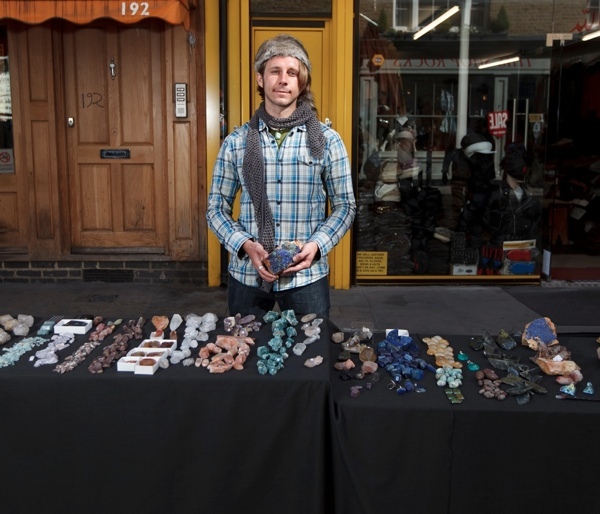 “I’m just hanging on,” he confessed to me in a whisper, “I don’t even break even but I don’t mind coming, as long as I don’t lose too much money.” It was an admission that revealed John’s depth of sentiment for Brick Lane. But then John remembered that he is close to paying off his mortgage, the result of thirty-seven years hard work here in the market, and brightened visibly, “Another three months, and I’ll be free in July!” he declared, triumphant. Thank you for another facinating post. 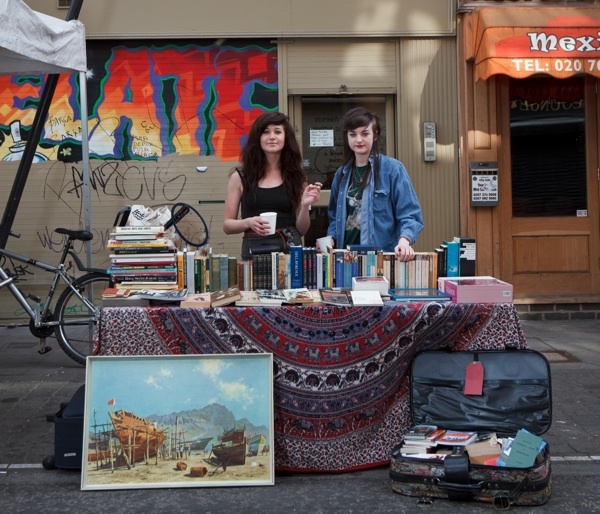 My wife and I love these traders; and are very fond of Mr Calcutt, who we have bought many many rugs over the years.